By including volunteering in Spark, Benevity makes it easy to give both time and money in one place, with features that include integrated rewards, simple time tracking, event promotion and search based on skills, interest, location and more. When it comes to doing good, small actions can add up to a serious impact. Get more people involved in your Goodness program at the grassroots level with Missions, Benevity’s employee engagement solution. Gamified and easy-to-complete activities promote awareness and learning that can make a real difference, for the individual and the company! Amplify the impact of your corporate philanthropy and community investment programs with an integrated grants solution that manages workflow, fosters collaboration and automates communication (and disbursement! ), while tracking and reporting on impacts. Using our Goodness API, you can create your own corporate giving or cause-driven marketing program and take advantage of its flexibility (and our backend of almost 2 million global charities) for e-commerce integrations, loyalty rewards programs and transactional interfaces. Whatever your business size, it’s Good for you. 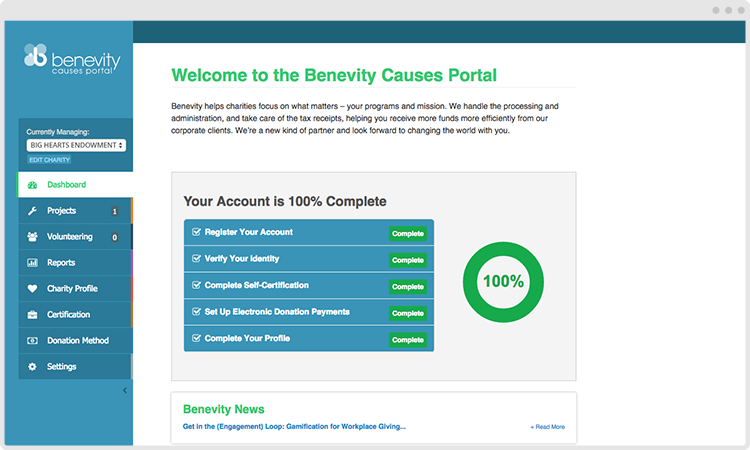 Benevity streamlines corporate donations to charities and non-profits, saving them time, effort and expense that doesn’t directly impact their mission. It’s simple for organizations to register and start receiving electronic fund transfers from some of the world’s largest corporate donors.